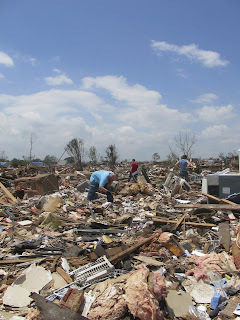 All of us who watched were devastated as we watched the tornadoes rip through Moore, OK in May 2013. I'm from OKC and I love that city, and I had family members and friends who lost houses in that storm. I'm blessed to be a part of a church that mobilized volunteers to go up and help several times, even putting in extra hours to finish a local mission project so we could go back up to Moore to serve. Baptist disaster relief has a great effort they have put in and have already given out over a million dollars in cash, and untold numbers of hours towards relief. As a pastor, I changed what I was going to preach at our upcoming services, trying to grasp where God was in the midst of these storms, and how we can worship Him in the middle of it all. Wrestling with what scripture tells us while dealing with tragedy is part of every pastor's job, but these storms hit close to home for many pastors. You can't flip on the news without hearing about all the alarming things coming in the future. Global Warming, over-population, lack of food, drought, hackers, NSA spying on people, and on and on. Each time we lose a worry like the Cold War, we pick up more to take it's place like domestic terrorism and chemical warfare. And that's just on a global level. In our own lives we deal with bad news from the dr, mounting bills, heaters going out, cars breaking, marriages falling apart, wayward children, abuse, neglect, and so much more. The future is a terrifying place. So much so that it drives many people mad, to hoard supplies for the coming apocalypse, or worse.